I guess Magik’s teleportation doesn’t work all that well considering they’ve got from the Highlands to…well, here. They seem to be standing at the X-mansion, but it’s too far in the future. Sunspot, Magma, Karma and Rhane are the only of the New Mutants to make the trip, and they’re sure in for a killer of a trip. Right from the get-go we see our misplaced heroes staring at a wanted poster straight out of Days of Future Past. Sentinels are on them in no time flat and though Sunspot and Magma hold their own, they’re still in need of a rescue by a much older Cannonball and Mirage. Keeping right under the radar, they’ve set up base camp in a decommissioned base where the Sentinels were conceived. 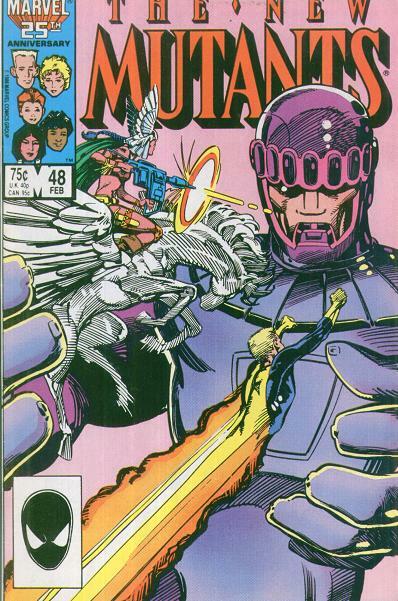 While the New Mutants are getting the low-down on the now from the Old Mutants, there’s a broadcast from the Sentinels about them having captured Cannonball’s ladyfriend, Lila Cheney. The New Mutants aren’t holding back on offering their help to be heroes, no matter what timeline they’re in. They’re faced by Sentinels, of course, one of whom has the ability to actively pursue targets even after parts of them have been taken out. This one’s even souped-up to look like Captain America because he can get the job done anywhere. As can the New Mutants. They rescue Lila without too much problem.